This month's newly redesigned market update report includes nearly all the essential housing market statistics I could get my hands on. In the article, I cover average sale prices, number of closed sales, active listing count, list prices, days on market and more. I've also included mortgage rates, distressed property sales and unemployment rates. Finally, I put together a brief housing market summary for each of my featured communities. Also, you'll find the information presented in the video is different from what's covered in the article, so make sure to watch it! Video Summary - Length: 06:25 - The median sale price in Metro Atlanta increased 7.7% year over year, along with the number of new listings, which were up 11.6%. We also saw the median list price increase around 8% compared to last year. The sale price to original list price ratio dropped, but still remains at just over 97%. The number of days on market has increased slightly in the past few months, but homes are still selling in about 90 days (list date to closing date). Increased sales along with a shortage of available properties has kept the months supply of inventory low, around three and a half months. This month’s real estate tip covers backup contracts… why they can be beneficial to both buyers and sellers. 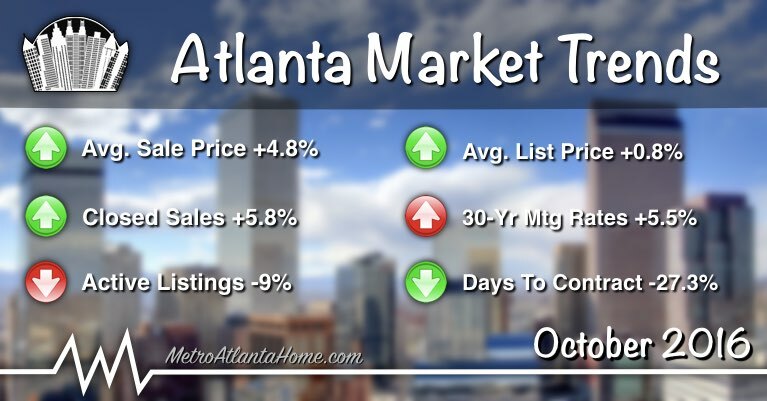 Continuing the upward trend it's been on the past few years, the average sale price in Metro Atlanta increased again in September. At $264,118, the average sale price was up 4.8% compared to September of 2015 when it was just over $252K. However, prices are down 3.2% from a month prior, as we finished up the month of August at $272,897. In the chart above, you can see how prices over the past five years have peaked in the early summer months, then begin to fall off in August and September. Unless interest rates suddenly spike, look for the average sale price to level off in the next few months, then continue the upward climb in the spring of 2017. Strong buyer demand, combined with an inventory shortage, should continue to drive home prices higher. So far this year, we’ve seen some very positive gains in the number of closed transactions. In September, there were 7,010 homes sold, an increase of 5.8% compared to September 2015 (6,625). Sales are down 13.3% from August, but we saw an abnormally high number of homes selling that month. With the number of pending sales still up, I anticipate sales to remain up through the rest of the year, with a nice sales spike in December, if history repeats itself. 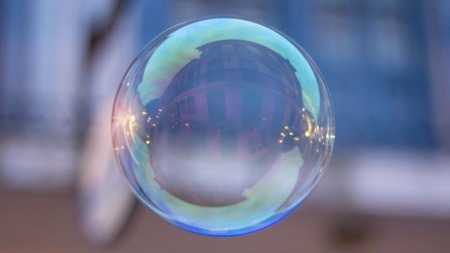 This year’s jump in closed transactions has essentially offset the influx of new listings hitting the market, preventing the number of homes available for sale from seeing much of an increase. Despite an increase in the construction of new homes, the active supply of homes for sale is still very low. You’d think with home prices returning to, even surpassing, pre-crash levels, sellers would be eager to cash out the equity they’ve gained. It appears that for many, making a move has been hampered by the lack of available options to purchase. Therefore, many potential sellers have held off on selling their home, fearing they’ll have nowhere to go once it sells. A moderate increase in new listings has helped, but it hasn’t been enough to overtake buyer demand. Last month, the active inventory of homes for sale was down nearly 9% YOY to just over 24,700 active listings. Until buyer demand slows, it appears the shortage of available properties will continue, creating a log jam with many move-up buyers caught right in the middle of it. Last month, the average list price of homes in Metro Atlanta increased about 0.8% from a month earlier, reaching $325,654. This price level is only slightly higher than it was in September of 2015, when the average list price was $322,865, due to a late summer spike. As you can see in the chart above, list prices tend to peak early in the year, then they start to taper off heading into the summer. In the past, we’ve seen a rebound in list prices around this time of year, ultimately falling off in the winter months. With high buyer demand and limited inventory, don’t expect asking prices to drop off too much in the near future. If current trends continue, we could see a big increase in list prices starting early next year. When the median number of days on market (DOM) is 24, you know there are tons of properties out there going under contract extremely quickly. When properly priced properties and “cream puff” homes go under contract before the first open house, they help drive the DOM down. So why isn't this number much lower? Well, I still see tons of unrealistic sellers who overprice homes in poor condition with the hope of finding a desperate buyer willing to pay their price. It rarely works out for them. The median total days on market has dropped 10.1%, from 69 days last year to 62 days this year. However, I’ve noticed that the number of days from contract to settle date has gone up this year, by 2-3 days. From speaking with fellow agents, and from personal experience, this is a result of slower processing, appraisal and underwriting times. Many lenders don’t have the resources to handle the current volume of loans, and a lack of available appraisers has lengthened the turnaround time on appraisals. This has caused many closings to be delayed. 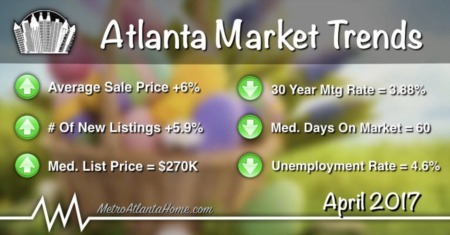 The price per sq/ft of homes in the Atlanta area is up across the board, as you can see in the charts below. I’ll start with the average list price per sq/ft of active listings, which was up 12.4% year over year. At $136 per sq/ft, the average list price is $20 higher than the five year September average. What’s driving list prices higher? Well, buyers have shown a willingness to pay increasingly higher prices. Case in point, the average sale price per sq/ft in September increased to $114, jumping 4.6% year over year. Although the median sale price per sq/ft is lower, it still reflects the price increases the market is producing. At $101 last month, the median price was down only $1 per sq/ft from summer highs, but increased $6 from September 2015, a 6.3% improvement. 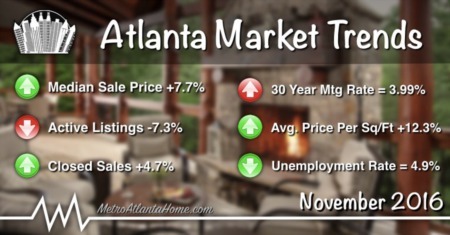 Current estimates show Atlanta home values are up approximately 7.5% in the past year. If you’ve been thinking about selling, now is the time to take advantage of this seller’s market. Need to know what your home is currently worth? Check out our home value estimator tool for a detailed property value report. As the housing market has continued to improve, so has the decline of foreclosed properties and REO sales. As you can see in the chart below, there were only 357 foreclosures in the month of September. This represents more than a 56% drop in the last year alone! There has been even fewer REO sales, and even those have dropped by 52.4%, from 204 to 97. This is why so many buyers looking for foreclosure deals haven’t had much luck. The few distressed properties we actually have, are not being heavily discounted like they used to be. Note: Monthly foreclosure and REO sale data was obtained from Bridge Interactive Group. Our analysis and the chart above are based on real estate data from the following counties: Barrow, Bartow, Carroll, Cherokee, Clayton, Cobb, Coweta, Dekalb, Douglas, Fayette, Forsyth, Fulton, Gwinnett, Hall, Henry, Newton, Paulding, Rockdale, Spalding, Walton. Mortgage rates were down for most of the summer, but have recently started increasing again. As you can see in the chart below, interest rates are up for every loan type compared to a month ago. The only decrease in rates were for 30-year fixed rate conventional loans, and VA loans, which did experience a drop from six months prior. Fortunately, rates are still extremely low, which helped fuel strong buyer demand over the summer months. The results of next month’s election could have a strong impact on rates, one way or another. According to the Mortgage Bankers Association (MBA), low rates and a strong job market have helped sustain mortgage refinance volume and purchase originations. It is expected that nationwide loan originations will reach $980 billion, an increase of approximately 11% compared to 2015 ($881 billion). Despite election woes, job numbers remain positive and the housing market remains strong; but many anticipate mortgage rates will begin to climb in 2017. Note: The interest rate estimates featured in the chart above were obtained from Bankrate.com. The mortgage rates listed are general estimates for the state of Georgia during the given time periods. Mortgage rates may vary by location, loan type and the amount financed. Specific rates depend on an individual borrower’s credit history, income and assets. This does not constitute an offer to lend or a guarantee of an interest rate. The unemployment rate in the Atlanta Metropolitan Statistical Area for September remained unchanged from the month prior, still hovering around 5%. Although the rate has bounced around from 4.5% to 5.3% over the past 12 months, the general trend has been downward over the past few years. Unemployment insurance claims dropped 10.3% in September of this year compared to September of 2015. With just over 11,400 initial claims in September, numbers were down more than 16% from a month earlier. Note: Market trend data includes active/sold residential properties (attached & detached) listed on FMLS. The percentage increase/decrease shown reflects the year over year change. 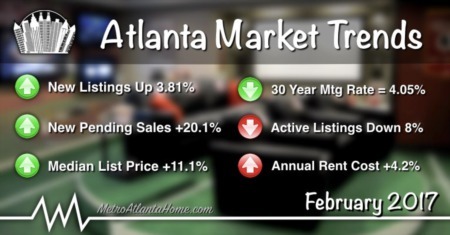 Alpharetta: Last month there were 199 (+5.3%) homes sold in Alpharetta at an average sale price of $351,711 (-5.8%). The average days on market was 41, down from 50 a year ago. The number of new listings increased 4.1% to 274, putting the number of total active listings in Alpharetta at 661 (+8.9%). Currently, the average list price in this area is $465,457 (+6.7%) at a price per sq/ft of $155 (+12.3%). Avondale Estates: Last month there were 13 (-31.6%) homes sold in Avondale Estates at an average sale price of $289,146 (-4.3%). The average days on market was 58, up from 51 a year ago. The number of new listings increased 25% to 15, putting the number of total active listings in Avondale Estates at 25 (-32.4%). Currently, the average list price in this area is $290,083 (-19.8%) at a price per sq/ft of $156 (-3.7%). Brookhaven: Last month there were 90 (+3.4%) homes sold in Brookhaven at an average sale price of $535,461 (+25.7%). The average days on market was 54, up from 43 a year ago. The number of new listings increased 25% to 120, putting the number of total active listings in Brookhaven at 283 (+13.7%). Currently, the average list price in this area is $589,222 (+12.9%) at a price per sq/ft of $210 (+5.5%). Buckhead: Last month there were 178 (+15.6%) homes sold in Buckhead at an average sale price of $568,109 (-3.1%). The average days on market was 62, up from 57 a year ago. The number of new listings increased 3.1% to 295, putting the number of total active listings in Buckhead at 884 (+8.3%). Currently, the average list price in this area is $738,250 (-7.5%) at a price per sq/ft of $272 (+3%). Chamblee: Last month there were 27 (-15.6%) homes sold in Chamblee at an average sale price of $335,852 (+20.9%). The average days on market was 46, up from 39 a year ago. The number of new listings increased 33.3% to 28, putting the number of total active listings in Chamblee at 41 (-21.2%). Currently, the average list price in this area is $323,768 (+12.7%) at a price per sq/ft of $174 (+4.8%). Decatur: Last month there were 51 (+10.9%) homes sold in Decatur at an average sale price of $376,124 (-1.1%). The average days on market was 60, up from 49 a year ago. The number of new listings decreased 11.6% to 61, putting the number of total active listings in Decatur at 122 (-8.3%). Currently, the average list price in this area is $526,547 (+13.1%) at a price per sq/ft of $227 (+4.1%). Doraville: Last month there were 14 (+280%) homes sold in Doraville at an average sale price of $172,643 (-28.4%). The average days on market was 15, down from 38 a year ago. The number of new listings decreased 14.3% to 12, putting the number of total active listings in Doraville at 13 (-51.6%). Currently, the average list price in this area is $220,633 (+19%) at a price per sq/ft of $138 (+26.6%). Duluth: Last month there were 94 (-3.1%) homes sold in Duluth at an average sale price of $284,861 (+1%). The average days on market was 47, up from 42 a year ago. The number of new listings increased 27.9% to 156, putting the number of total active listings in Duluth at 330 (-4.9%). Currently, the average list price in this area is $394,041 (-2.2%) at a price per sq/ft of $121 (+5.2%). Dunwoody: Last month there were 58 (-7.9%) homes sold in Dunwoody at an average sale price of $378,358 (+3.1%). The average days on market was 52, up from 45 a year ago. The number of new listings increased 5.2% to 81, putting the number of total active listings in Dunwoody at 156 (-7.7%). Currently, the average list price in this area is $475,785 (+20%) at a price per sq/ft of $174 (+7.4%). Johns Creek: Last month there were 101 (-20.5%) homes sold in Johns Creek at an average sale price of $388,574 (+2.1%). The average days on market was 43, down from 50 a year ago. The number of new listings increased 15.3% to 158, putting the number of total active listings in Johns Creek at 438 (+3.1%). Currently, the average list price in this area is $510,635 (+0.7%) at a price per sq/ft of $151 (+9.4%). Lilburn: Last month there were 89 (+21.9%) homes sold in Lilburn at an average sale price of $222,046 (+18.8%). The average days on market was 34, down from 48 a year ago. The number of new listings increased 10.8% to 82, putting the number of total active listings in Lilburn at 190 (-18.1%). Currently, the average list price in this area is $236,586 (+2.9%) at a price per sq/ft of $93 (+2.2%). Norcross: Last month there were 65 (+14%) homes sold in Norcross at an average sale price of $209,237 (+42.6%). The average days on market was 35, down from 40 a year ago. The number of new listings increased 17.4% to 101, putting the number of total active listings in Norcross at 139 (-29.8%). Currently, the average list price in this area is $213,171 (-6.2%) at a price per sq/ft of $99 (+2.1%). Roswell: Last month there were 167 (+18.4%) homes sold in Roswell at an average sale price of $393,880 (+9.9%). The average days on market was 35, down from 51 a year ago. The number of new listings increased 38.9% to 218, putting the number of total active listings in Roswell at 462 (-0.6%). Currently, the average list price in this area is $463,784 (+1.9%) at a price per sq/ft of $154 (+11.6%). Sandy Springs: Last month there were 145 (+11.5%) homes sold in Sandy Springs at an average sale price of $418,672 (-3.9%). The average days on market was 56, up from 55 a year ago. The number of new listings increased 0.4% to 228, putting the number of total active listings in Sandy Springs at 630 (-2.9%). Currently, the average list price in this area is $638,078 (+14.6%) at a price per sq/ft of $190 (+16.6%). Tucker: Last month there were 51 (-5.6%) homes sold in Tucker at an average sale price of $229,157 (+4.5%). The average days on market was 32, down from 57 a year ago. The number of new listings decreased 12.1% to 51, putting the number of total active listings in Tucker at 129 (-16.8%). Currently, the average list price in this area is $255,010 (-3.9%) at a price per sq/ft of $109 (+7.9%).